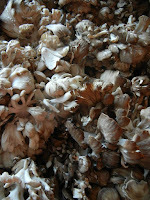 I'm on a mushroom kick lately - all shapes and sizes are readily available at our local Farmer's market, Tacoma Food Co-op and many Asian markets (when I venture into the city). Lately, I've seen beautiful pictures where fancy vegan chefs take mushrooms and make "fried-chicken-style" mushrooms, or crispy brown "mushroom drumsticks" - making us all drool on Instagram, Pinterest and Twitter. And I thought... "How hard can it be?" If you can get your hands on a bunch of mushrooms like hen-of-the-woods or small clumps of oyster mushrooms, you break them apart into pieces and batter and fry in little 'drumsticks' of mushroom deliciousness. The results are off-the-chart (fried things + mushrooms. What's NOT to love?). I've only made these about four times so if my directions are a bit vague, it's because the recipe is still in it's beta version. Feel free to let me know how yours turn out. I brought leftovers to work and my co-workers genuinely FREAKED out, thinking I had jumped WAY off the vegan boat!! Put Wet Mix in a deep bowl, and Dry Mix in a pie plate or flat dish. 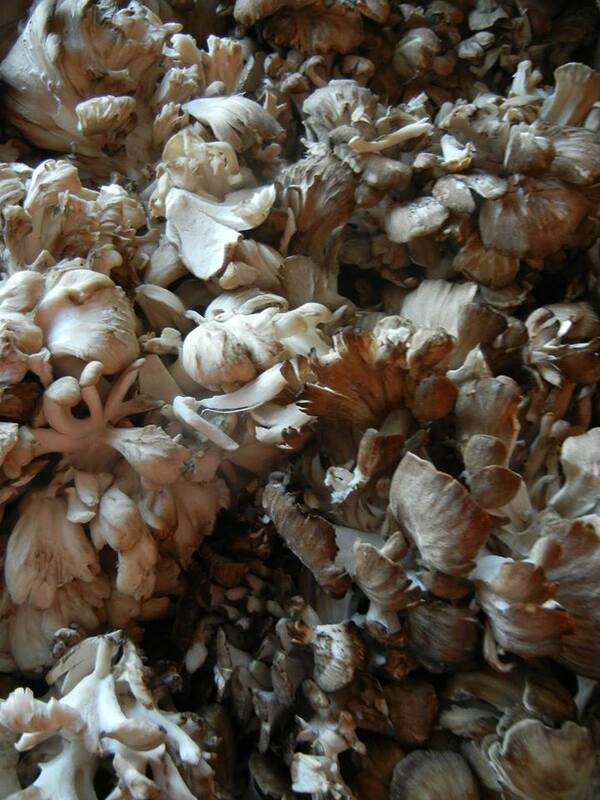 Brush any debris from mushrooms, wipe with damp paper towel if needed. Cut or break apart lengthwise, keeping part attached to main stem, into small, roughly "drumstick" type pieces. (If smaller pieces fall off that's OK, they can be fried up too!). Heat 1 inch of oil to med high (I prefer refined-flavorless coconut oil but canola oil is just fine) in a small cast iron skillet. (Any size is fine but a smaller pan uses less oil). Dip mushroom pieces into Wet Mix until well coated, let excess drip off. Then dredge in Dry Mix, patting a bit to get it to stick if needed. Lay several pieces carefully in hot oil. Don't crowd pan. Working in batches, fry the mushrooms in the hot oil for about 2 to 3 minutes each side, turning occasionally with tongs, until the surfaces are golden brown. (If they brown too fast, turn heat down a little). Remove immediately from oil and set on paper towels to drain. Place in low oven to keep warm. Continue with the rest of the pieces. 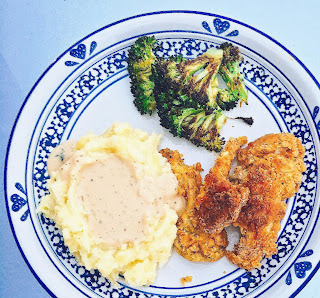 Serve with vegan ranch or hot sauce to dip - or make a full on "chicken dinner" with veggies, mashed potatoes and gravy!! OMG!! Tofu Mom, that looks and sounds amazing!! This is the first I'm hearing of mushroom fried "chicken," and it's genius!!! Hi, long time lurker first time commenter! Made these with some maitakes we got in our CSA. Very tasty snack with some beer! A couple comments for others who may want to make it.... our dry mix was a bit bland, but our bouillon was low sodium so we added salt and more spices and then everything was good! It was our first time deep frying so a little bit of mishap there but they were still super tasty! Thanks for the recipe! Love your food.